Brian May Reveals Pet Name for Adam Lambert! You are here: Home / 2017 Queenbert / Brian May Reveals Pet Name for Adam Lambert! 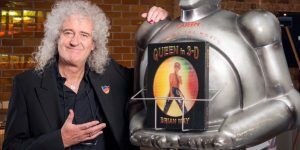 Brian May appeared on Los Angeles’s local news channel KTLA yesterday to promote his appearance that night at Book Soup for his book “Queen in 3-D.” He was speaking with the news team and the conversation led to Adam Lambert. Take a listen. YouTube video courtesy of AddictedToAdam. Here’s a longer version of the interview. YouTube video courtesy of KTLA 5. I’m sure many people have created pet names for him [Adam Lambert] by now…..I am not going to tell you my pet name for him…. Gift from God indeed …. What a great name for our Adam. The fact that Brian thinks Freddy would love him makes it even better. It’just all good. Love this. Thanks Carol.